Many teachers use technology in their daily lives, but integrating it into the classroom is a different story. Effective teaching with technology takes training and practice. 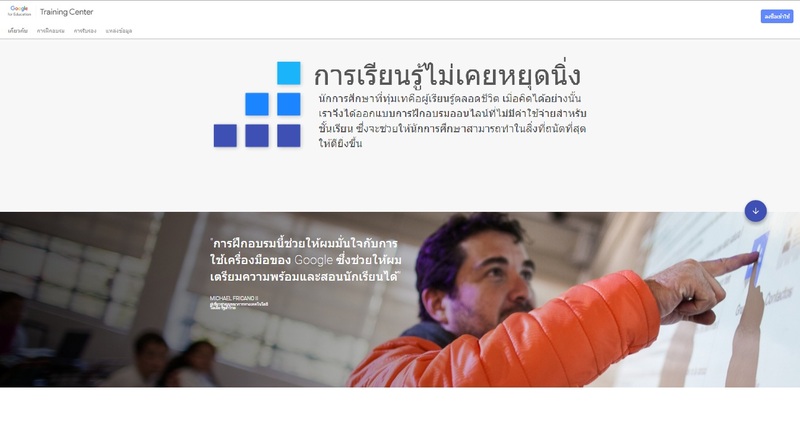 We’re happy to introduce a powerful resource for Thailand’s 600,000 educators to build that knowledge and become Google Certified Educators with the Google for Education Training Center available in Thai. The Google for Education Training Center and Google Certified Educator Exams are designed to help teachers implement Google in the classroom. Inspired by ISTE (International Society for Technology in Education) standards, the Training Center includes training videos, suggested tools, and ideas focusing on three important themes: involvement in professional development, increased efficiency and improved time management, and inspiring learning ability and creativity of students. The Damrongrat Songkroh School in Chiang Rai is a great example of a school that is using technology in their classrooms. They started using Google Apps for Education in 2014 and it has been a huge success for teachers and students. From creating assignments and being able to complete them on desktop or mobile devices to a shared discussion board where teachers can give quizzes and students can discuss topics, the possibilities for learning have greatly expanded. Try to combine a different source of education to make more profit. Here you can experience the best essay title examples for your videos. Banyak guru saat ini memilih untuk menggunakan teknologi dengan kehidupan sehari-hari. Tetapi integrasi teknologi untuk mengajar dan belajar di dalam kelas adalah cerita lain yang berbeda.